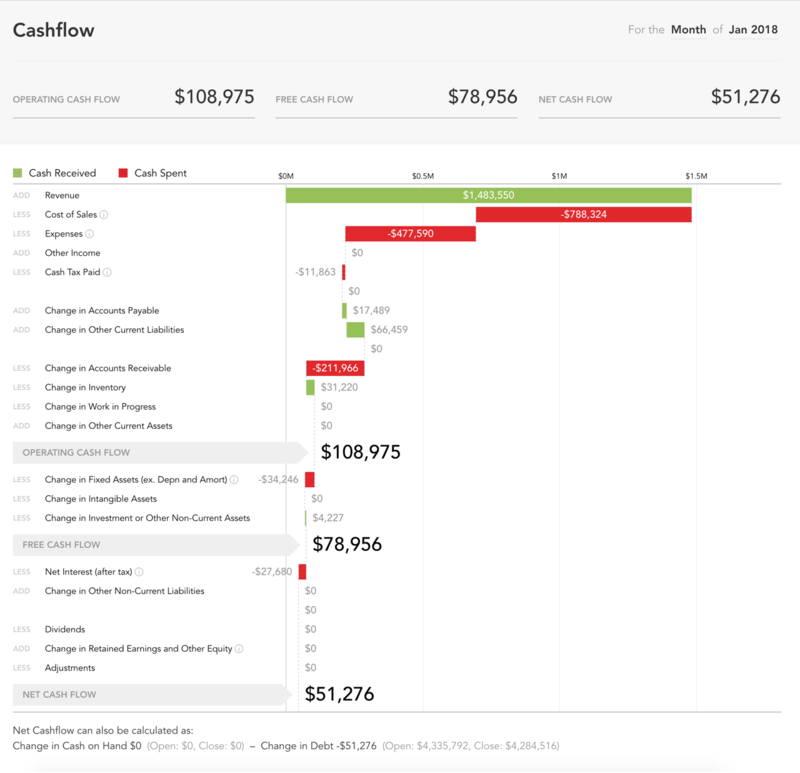 The Cash Flow tool helps to answer the question, "Where has my cash gone?". What is the quality of the cash flow? Is cash flow sourced from core operations? Is cash flow sustainable or subject to fluctuations? Key numbers are displayed at the top of the tool. Clicking on these numbers will drill down into additional detail about these cash flow measures, including how they’ve trended over time. Operating cash flow is the cash generated by the operating activities of the business. Operating activities include the production, sales and delivery of the company’s product and/or services as well as collecting payment from its customers and making payment to suppliers. Free cash flow is the cash generated by the business after paying its expenses and investing for future growth; it is the cash left after subtracting capital expenditure from operating cash flow. The term “free cash flow” is used because this cash is free to be paid back to the suppliers of capital. Net cash flow is the cash left after subtracting expenditures from financing activities from the free cash flow. Financing activities include the inflow of cash from investors such as banks and shareholders, as well as the outflow of cash to shareholders as dividends. The waterfall chart helps to identify cash-in (green) and cash-out (red). Why doesn't the calculation at the bottom reconcile to the 'Net Cash Flow'? In most cases the calculation will reconcile perfectly, however if the balance sheet is out of balance for the current period you may see a discrepancy.